Head-On, Stories of Alopecia is a collection of personal narratives that follow the courageous journeys of over 75 writers as they find their way after being diagnosed with alopecia areata, a hair loss condition that affects over 146 million men, women and children throughout the world. What begins as just a small bald spot eventually leads to a diagnosis of a confusing and relatively unknown autoimmune disease. They soon learn there are no reliable cures and that alopecia could possibly last a lifetime. Their discovery of acceptance, adaptability and finally celebration are intertwined in these thought-provoking inspiring stories and captivating photos. As they unearth their new identities and reclaim their lives, there is no doubt you will begin to recognize your own distinct ability to tackle any challenge of your own, Head-On. 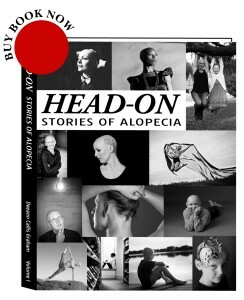 Head-On, Stories of Alopecia is available now for purchase. Click on the BUY button today for your autographed copy. Please subscribe to our newsletter on the right to get all the updates about Head-On, Stories of Alopecia. I travel often and am available for speaking engagements, especially to alopecia support groups. The newsletter is the best way to find out when I will be in your hometown. My 7 year old daughter has Alopecia and looks through this book all the time. She would like to share her story, and she is wondering if you plan to publish another book that she might be a part of. I am bald and consider it the comfort zone. I find the hairless, both genders, are as beautiful as anyone and more comfortable. My 7 years old daughter has Alopecia, She have to most positive spirit. She refused to cover her head, she said that sh has “Rockstar hairstyle”. She would to share her story! !